In the near future, when books are looked upon as objects of pure nostalgia, the concept of a bookplate might need a bit of explaining: Before the reign of e-books, streaming content, and information stored in a mythical “cloud,” people stockpiled hardcovered paper objects full of written words. 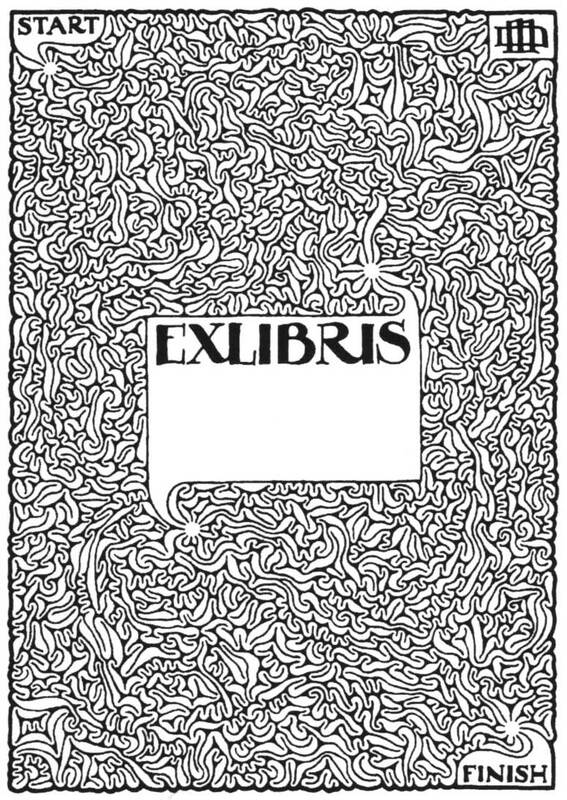 Of those educated persons who maintained personal libraries of their favorite tomes, the more affluent sometimes commissioned unique, artist-designed bookplates, which were affixed inside the book’s cover to make its allegiances clear. Books aren’t quite an endangered species yet, and the Association of American Publishers reports that sales of physical books are actually on the rise. 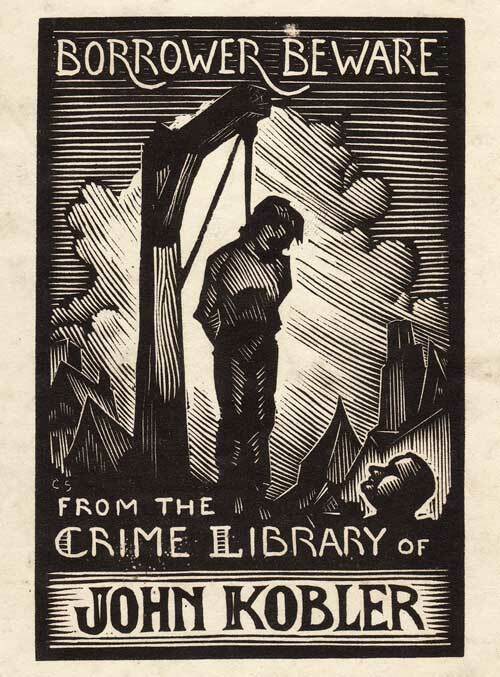 Nevertheless, many who consider themselves avid readers have still never seen a bookplate in person—which makes sense, considering the trend peaked around a century ago. 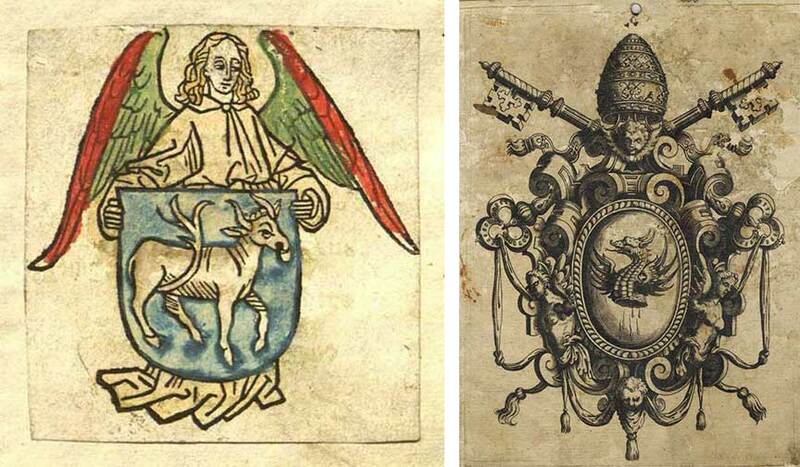 In fact, the use of bookplates started much earlier, with the oldest known plates dating to mid-15th-century Germany. From its earliest days, the bookplate was a status symbol, expressing the individuality of a book’s owner as much as preventing theft. The European nobility who could afford their own private libraries adopted bookplates as one of many tools in their arsenal to remind others of their standing. 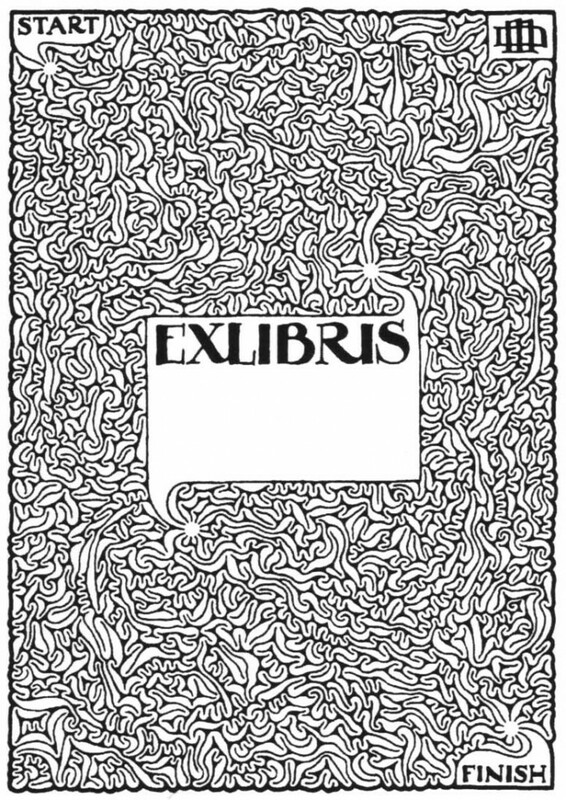 Bookplates were also called “ex libris,” after the Latin phrase meaning “from the books of,” a phrase that was frequently incorporated into their design. Jaffe explains that in the United States, early engravers who worked with fine silver and other metalware, like Paul Revere or Nathaniel Hurd, often designed bookplates as well. 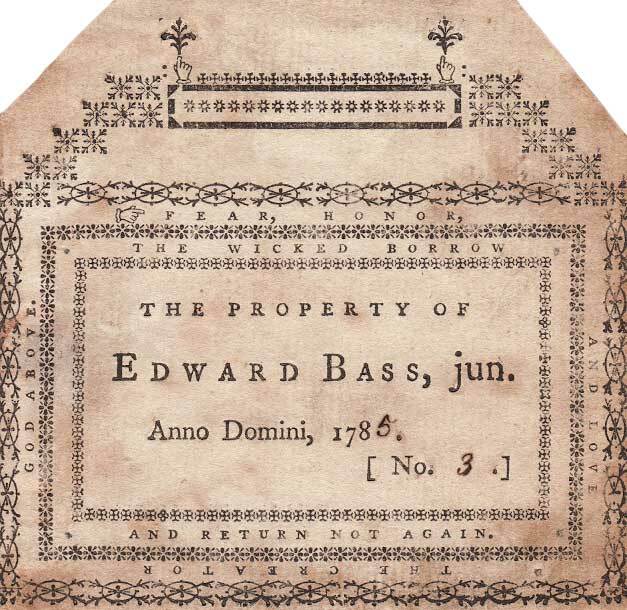 “If you’re into 18th-century American bookplates,” Jaffe says, “I suppose having George Washington’s bookplate or any of the designs by Paul Revere would be a holy grail.” Around the same time, some printers created cheaper book labels using lettering and basic borders for clients with less artistic aspirations. Name labels sometimes included a city, date, or favorite motto and could be easily mass-produced using a press with movable type. In the late 19th century, the rising capitalist tides of the Industrial Revolution gave the bookplate new life as a badge of prestige for America’s nouveau riche. “Beginning in the 1890s, Americans were coming over to Europe and buying whole collections and libraries to bring home, though they probably didn’t even read those books—it was a show-and-tell kind of thing,” Jaffe says. “Americans, for the most part, didn’t have coats of arms, so they would hire an engraver, and the engraver would ask, ‘What design do you want?’ and they’d say, “Well, I have a pretty dog,’ or ‘I like to go fishing,’ or whatever. That’s how the more creative end of bookplate design really started. It was an affectation.” While most artists weren’t known specifically for their bookplates, Jaffe says that a few, like Edwin Davis French, did establish a reputation for their stunning ex libris engravings. 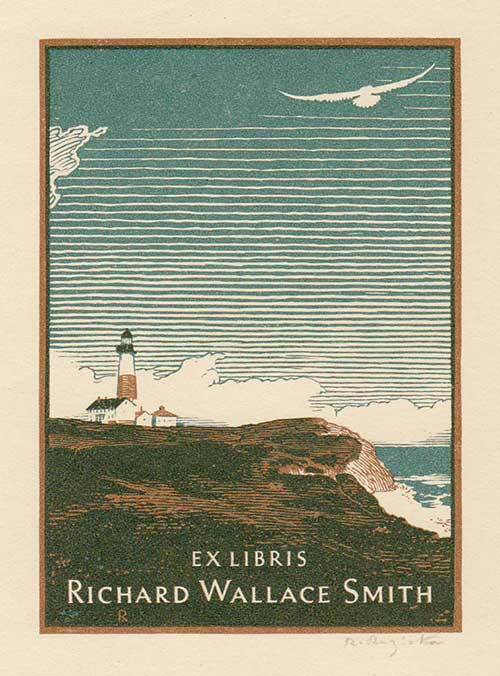 Like a carefully curated home library, the imagery of a custom bookplate spoke to a person’s favorite subjects, hobbies, or values. For creative types, bookplate designs might be executed by beloved illustrators or feature symbols of their chosen art forms, while labels for people of faith could incorporate religious symbols and those for sports fanatics could display their games of choice. Beyond Europe’s ubiquitous crests and coats of arms, other popular themes included ancient castles, ships sailing on the ocean, magnificent trees and landscapes, classical nudes, animals (especially cats), starry night skies, and, unsurprisingly, books. Throughout the early decades of the 20th century, the mass production of paperbacks and increased literacy in the United States made books accessible to many more Americans than before. 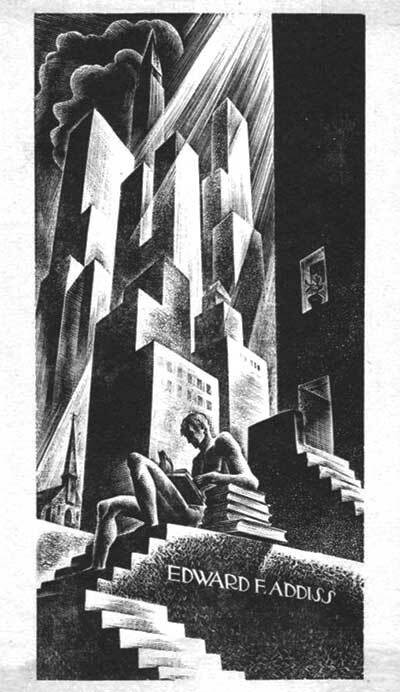 By the late 1920s, more middle-class Americans were building personal book collections and wanted to label them accordingly, though they couldn’t afford an artist-commissioned bookplate. “Entrepreneurs rose to the occasion and created what we call ‘universal bookplates’ which are the kind you find in a stationery store today: There’s a box of bookplates with a pretty picture on them, and a blank where the name’s supposed to be. You’d either put your name in with a typewriter or pen, or you could have it printed in,” Jaffe says. Just as universal bookplates became accessible to less-affluent people, the popularity of personalized, artist-made designs also began to decline. 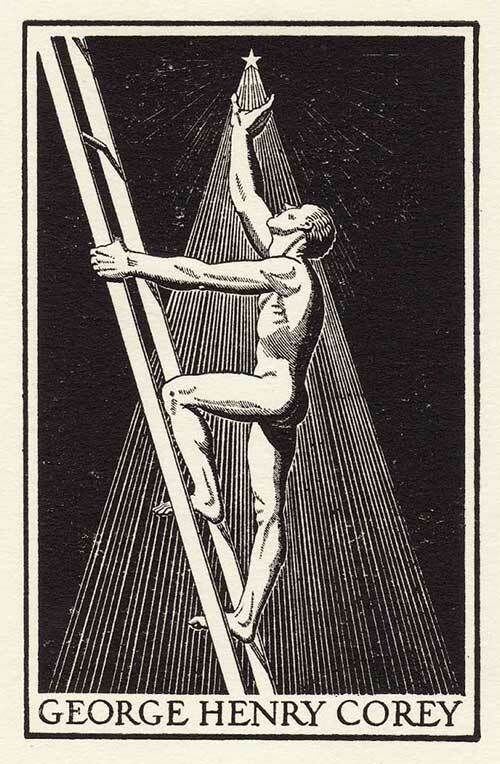 Even so, artists like Rockwell Kent continued to receive accolades for their unique bookplate art. For those hoping to start a bookplate collection of their own, Jaffe suggests joining a bookplate society like the American Society of Bookplate Collectors & Designers or The Bookplate Society (based in the U.K.), or befriending antiquarian booksellers or hand bookbinders, since they often save bookplates from volumes they’ve mended or books that were beyond repair. 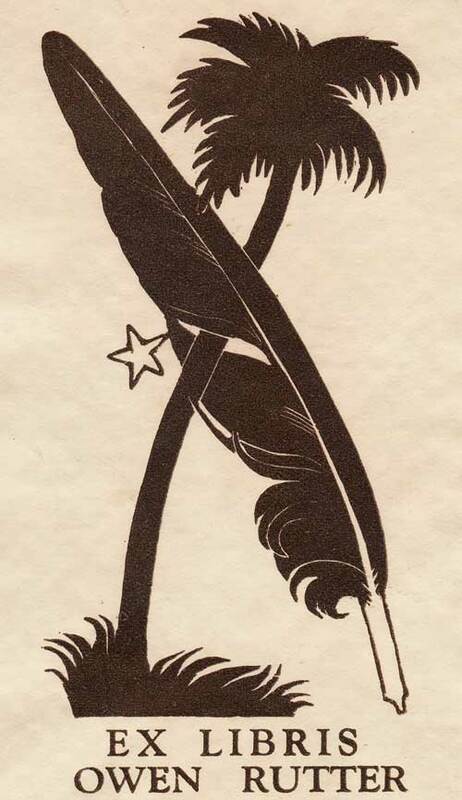 As far as aesthetics are concerned, a bookplate collection can focus on any subject matter or visual genre, like Art Deco or exotic birds, as ex libris imagery runs the gamut. 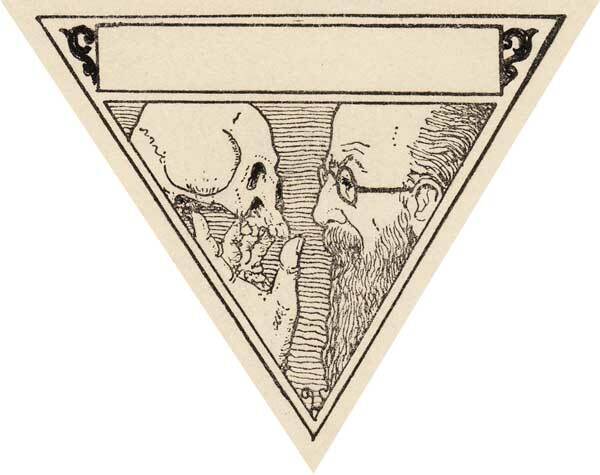 On his blog, Jaffe has organized his bookplates into a variety of thematic micro-collections featuring imagery ranging from science fiction to Judaism, from automobiles to medicine. “I even have a group of bookplates featuring people with detached heads,” Jaffe says. 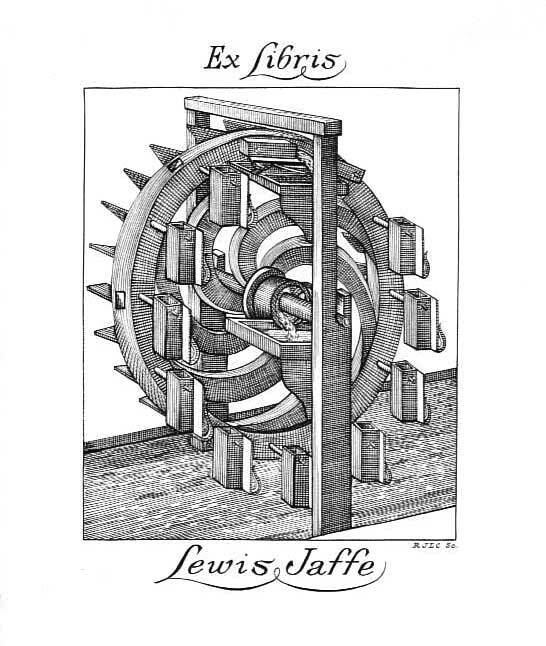 One of Jaffe's personal bookplates, depicting a waterwheel. 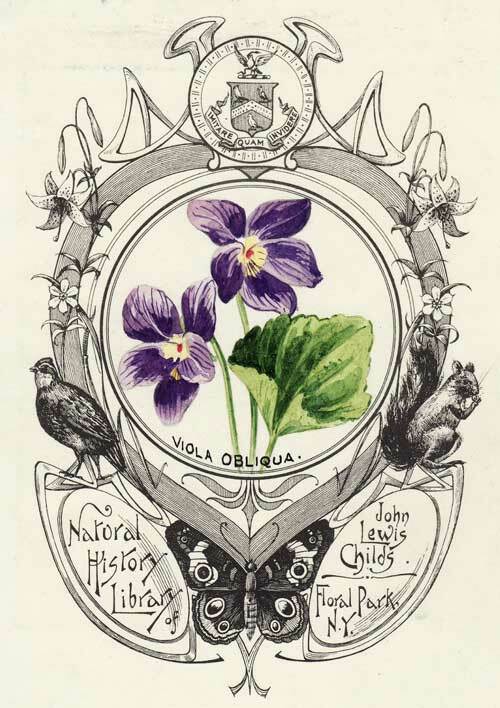 The bookplates for horticulturist John Lewis Childs' Natural History Library include elaborate hand-colored flora and fauna. James Doyle, Jr., created this etching for W.S. Galloway in 1924. 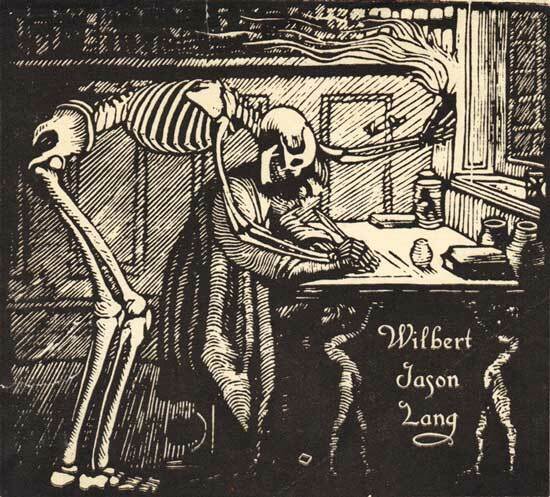 Many bookplates feature memeto mori, like this woodcut for Wilbert Jason Lang. Two designs by Fridolf Johnson, circa 1930s. 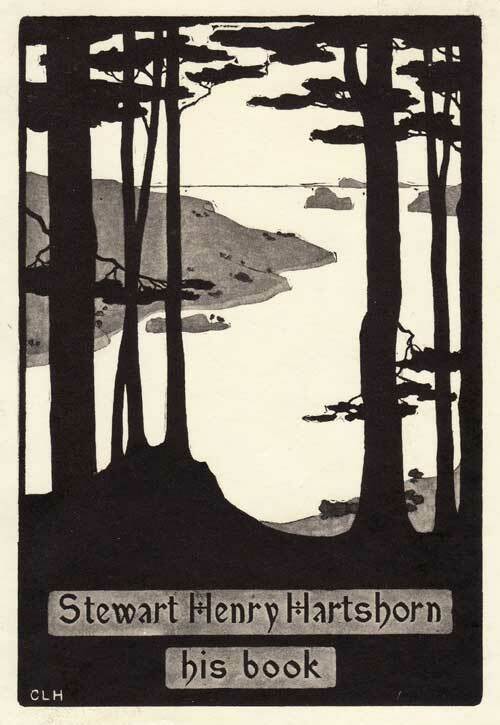 A bookplate for Stewart Henry Hartshorn with Eastern woodblock influences, circa early 20th century. 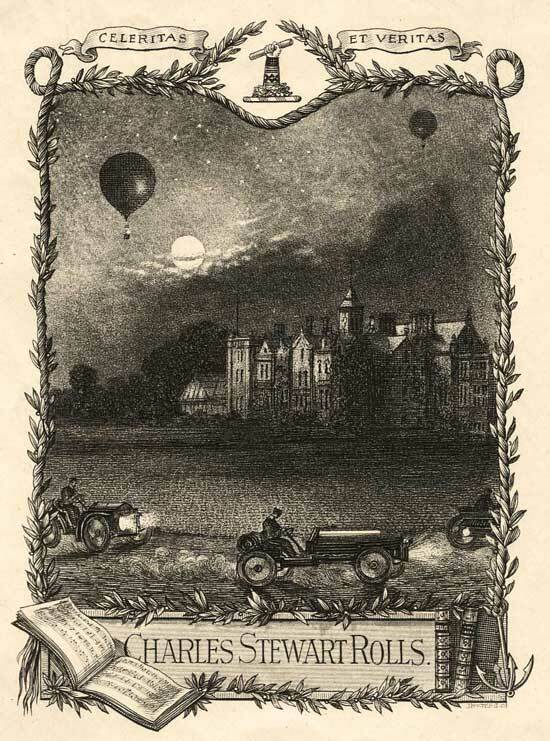 The bookplate of Charles Stewart Rolls, aviator and co-founder of the Rolls-Royce company, featured automobiles and hot-air balloons. 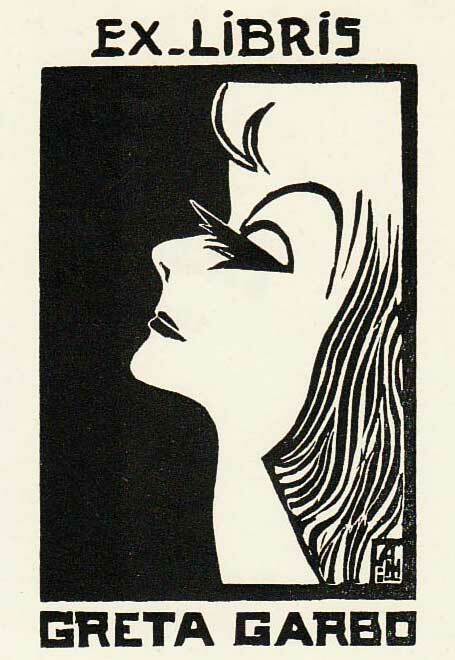 Actress Greta Garbo used this self-portrait bookplate created by A. Herry around 1939. 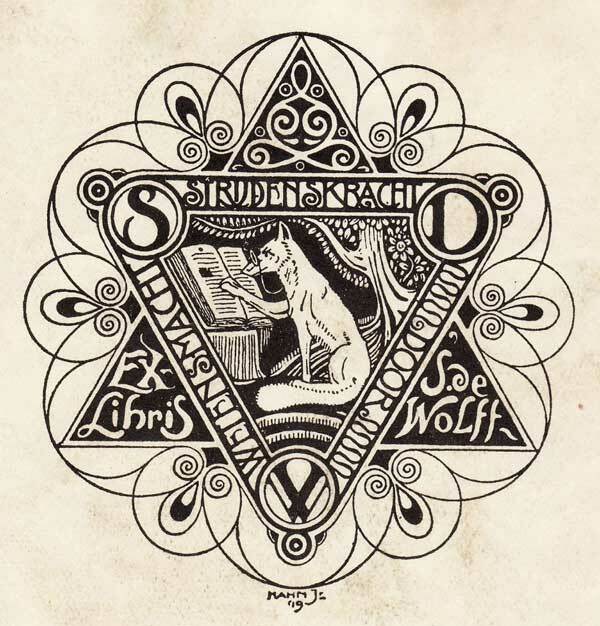 Albert Hahn, Jr., created this Star of David design for a Dutch politician and economist named Salomon "Sam" de Wolff who co-founded the Amsterdam branch of Poalei-Zion. 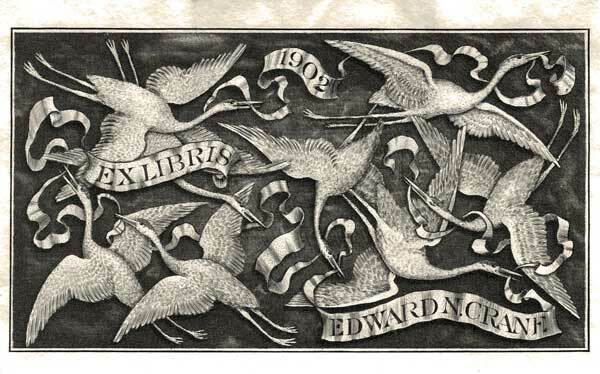 Some ex libris imagery plays off its owner's name, like this design for Edward N. Crane. 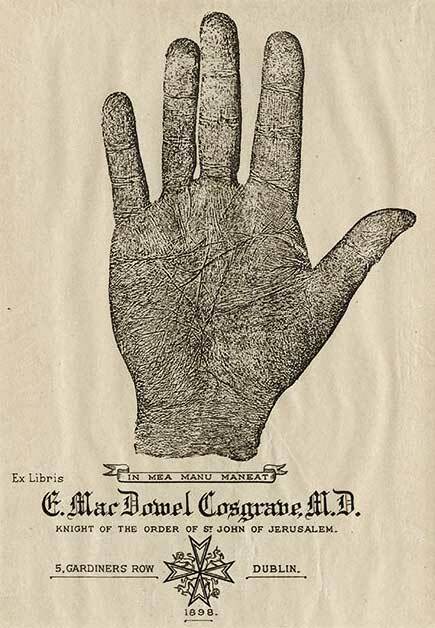 The Latin phrase on Dr. MacDowel Cosgrave's bookplate reads "In mea manu maneat" or "Let it remain in my hand." 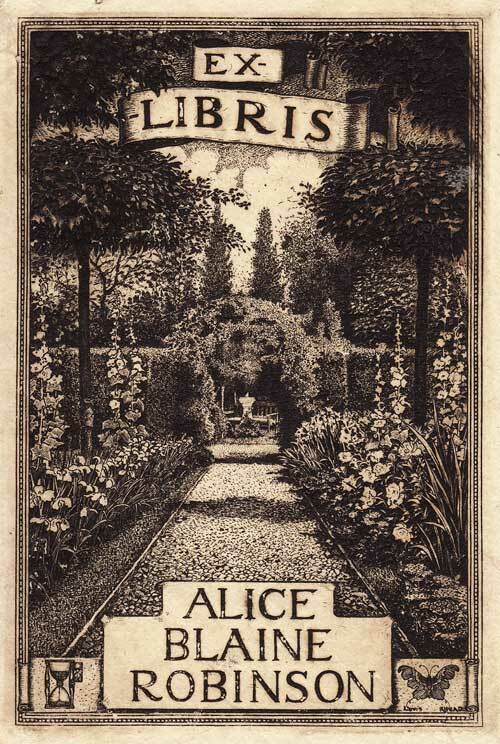 Alice Blaine Robinson's plate from the early 20th century was created by artist Louis Rhead, who was well-known for his ex libris designs. 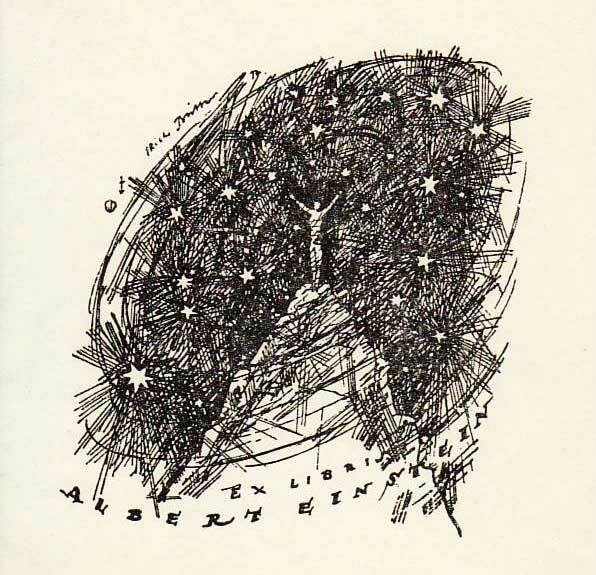 Albert Einstein's bookplate was designed by Erich Buttner around 1917 and depicts man amid the cosmos. 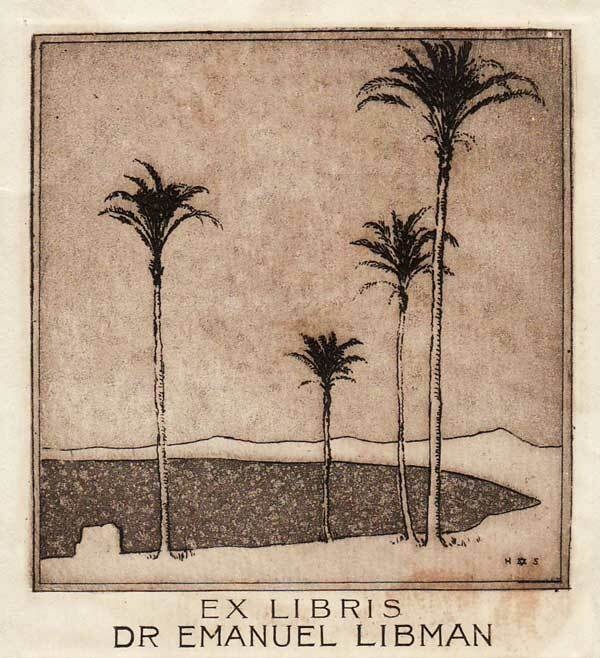 An Israeli desert scene on the bookplate for Dr. Emanuel Libman by Herman Struck. Dr. Weston D. Bayley was a neurologist interested in hypnotism, hence the ghostly imagery. A seaside vista by Rudolf Ruzicka for Richard Wallace Smith. 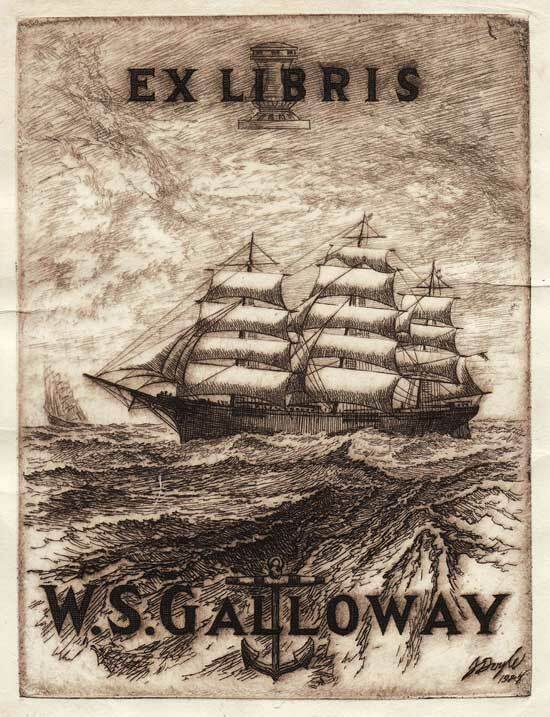 The ex libris for historian and travel writer Owen Rutter was possibly designed by Robert Gibbings. A Rockwell Kent engraving for George Henry Corey from 1940. 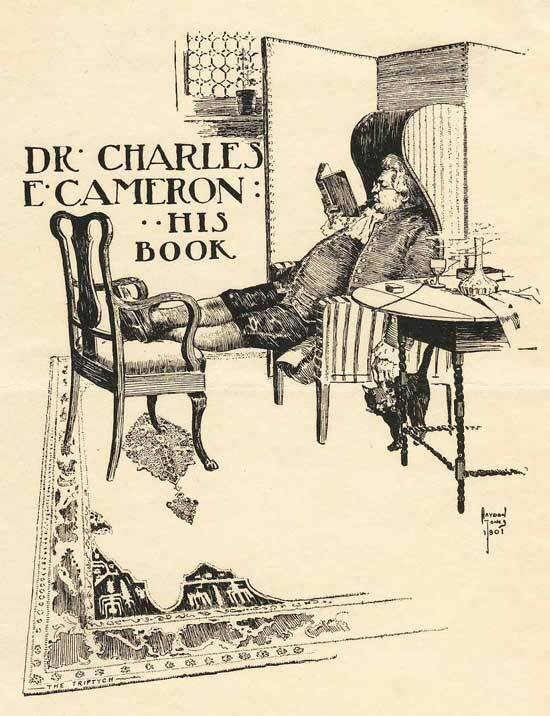 Haydon Jones designed this bookplate for Dr. Charles E. Cameron. Created by A.J. 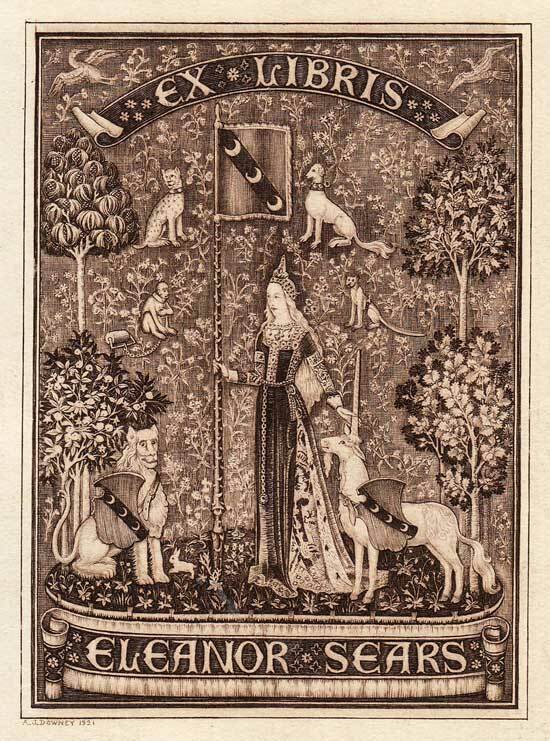 Downey in 1921, Eleanor Sears' bookplate mimics the style of a Renaissance tapestry. 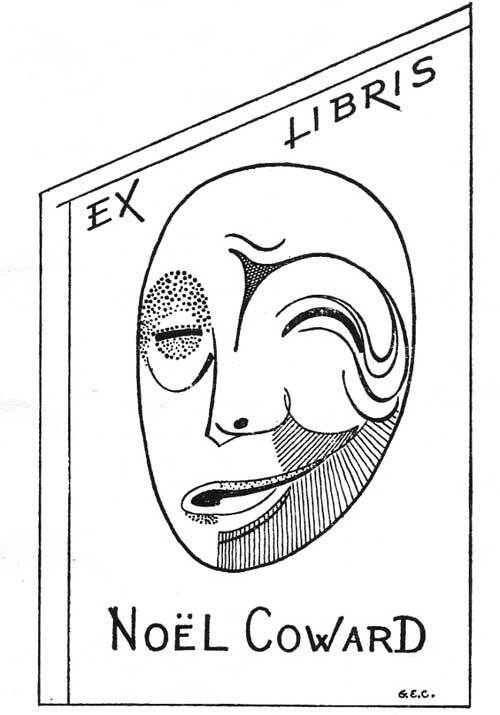 Playwright Sir Noël Coward's bookplate features an abstracted theatrical mask. 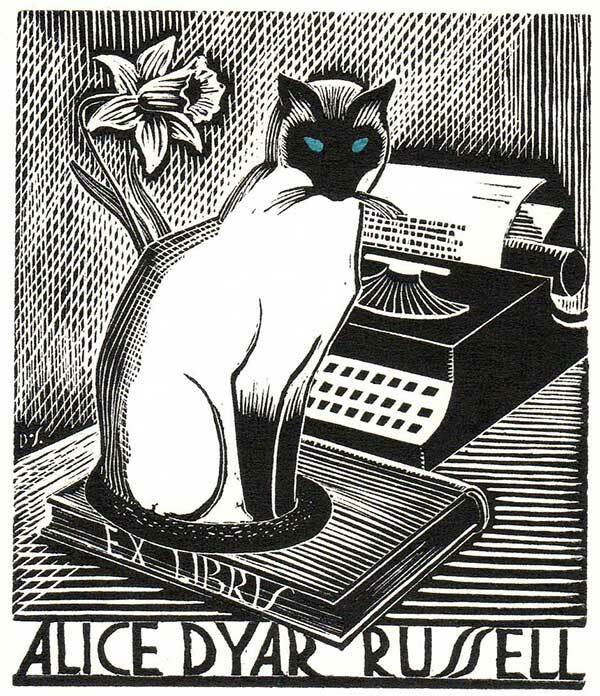 A mid-20th-century bookplate for author Alice Dyar Russell. An Art Deco illustration by Lynn Ward for Edward F. Addiss. 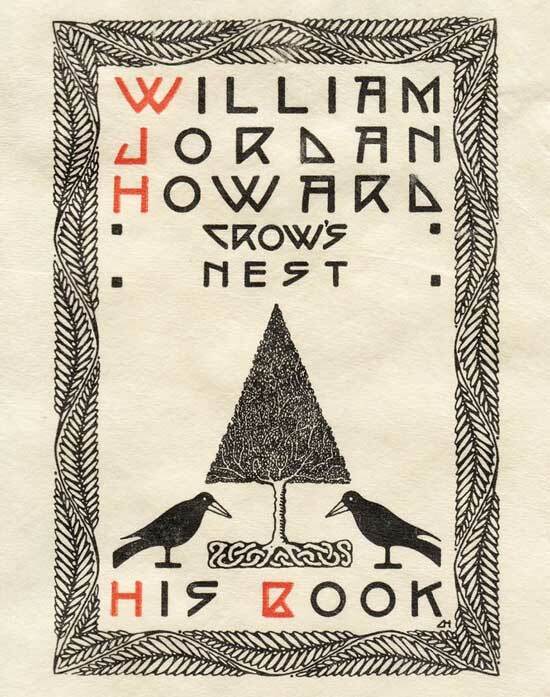 Dard Hunter, a member of the Roycroft studio, made this bookplate for William Jordan Howard. 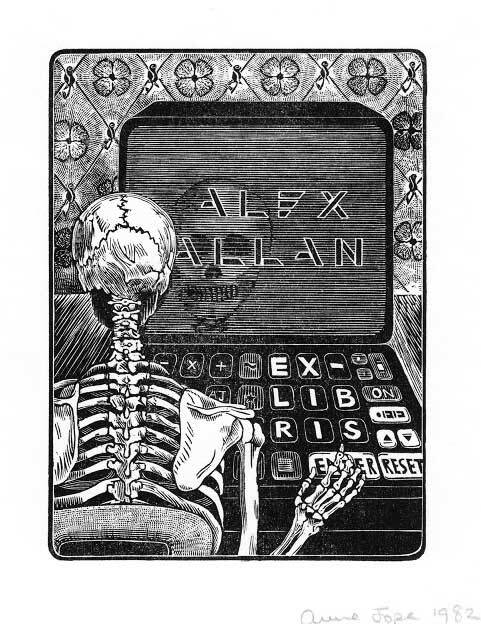 Anne Jope's 1982 woodcut bookplate for Alex Allan is one of the earliest to include a computer. 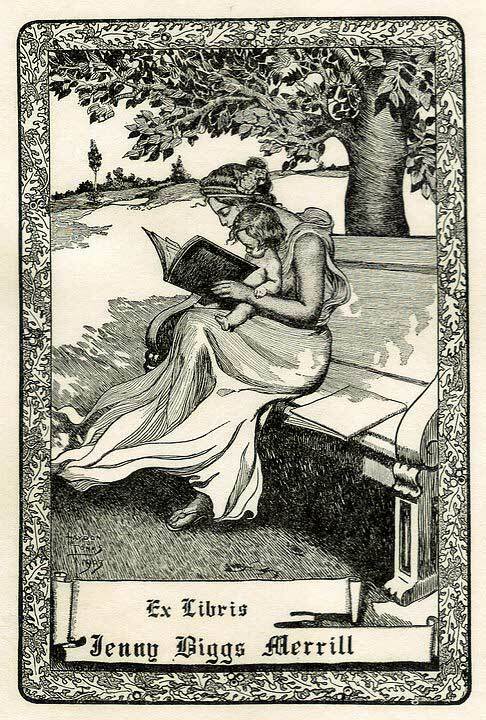 A bookplate by Haydon Jones for Jenny Biggs Merrill. 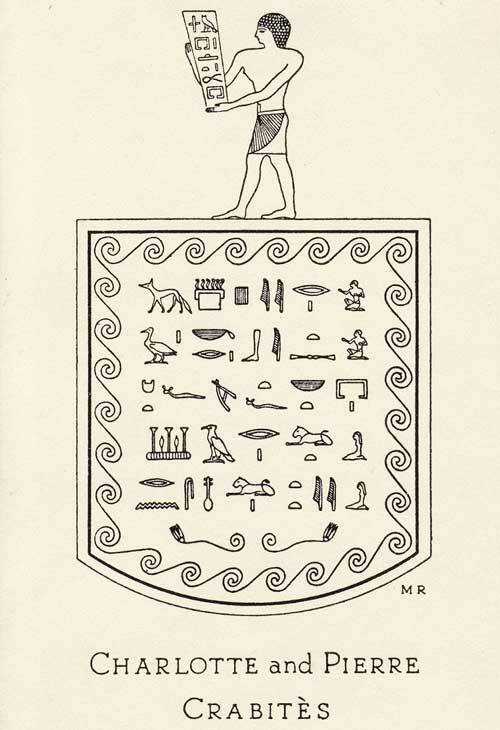 This hieroglyphic bookplate was created by Mary Reisner for Charlotte and Pierre Crabitès, circa 1920s. 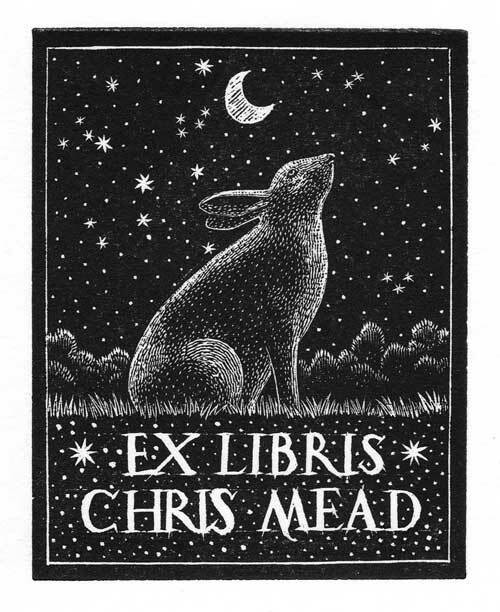 Rabbits are often featured on bookplates, as in this design for Chris Mead. 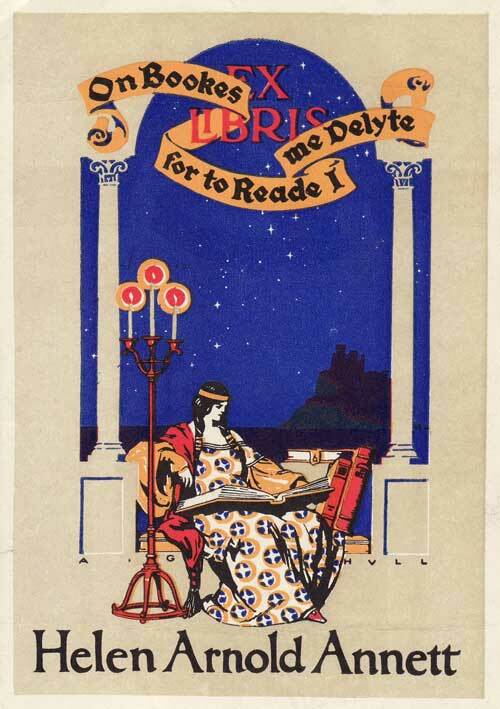 Helen Arnold Annett's ex libris features the Chaucer quote "On Bookes for to Reade I me Delyte." 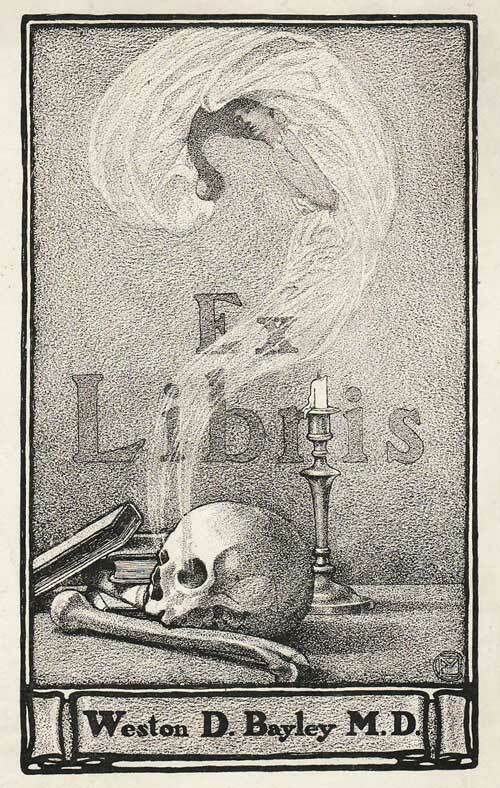 A mysterious universal bookplate in Jaffe's collection. I’m an avid reader and never really knew this had been a thing. Pretty cool. The art deco one reminded me of the cover of Atlas Shrugged and there was another that really made me thing of The Great Gatsby cover. In an otherwise excellent article it’s too bad it begins with this lemming-type of the digital cognoscente. There is zero evidence for it. But I guess it looks cooler to start with something hip and provocative and then admit it isn’t true a few sentences later. Paper is an incredible technology and is still capable of a few profound things the screen is not. And while it’s true that paper-based publishing is diminishing, there are volumes of instances in history where objects or tools went from being widely used to moderately used. But apparently it would be too boring and unhip to take such a position. 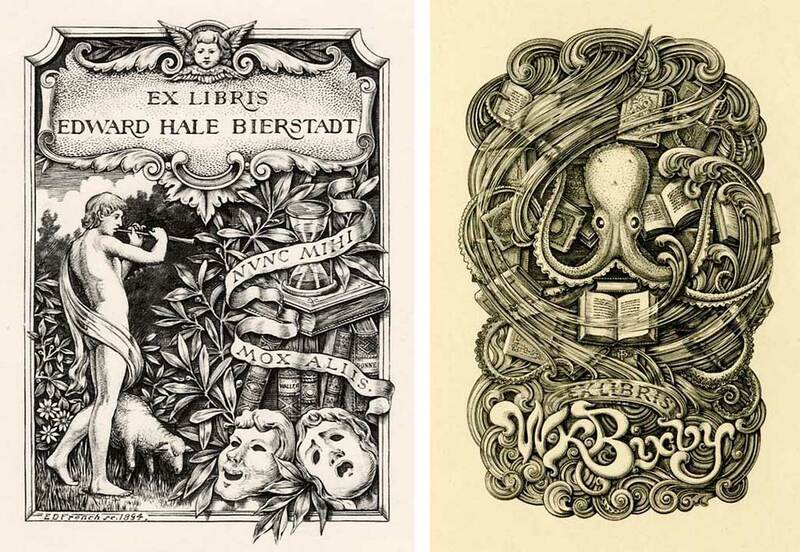 Production and use of bookplates may have diminished, but are far from dead. You only have to visit http://www.bookplatesociety.org to find a twice-yearly journal of high quality, relating to the study of bookplates, historic and modern, and the subscription is good value. Identification of bookplates is facilitated by the CERL Provenance Query website. 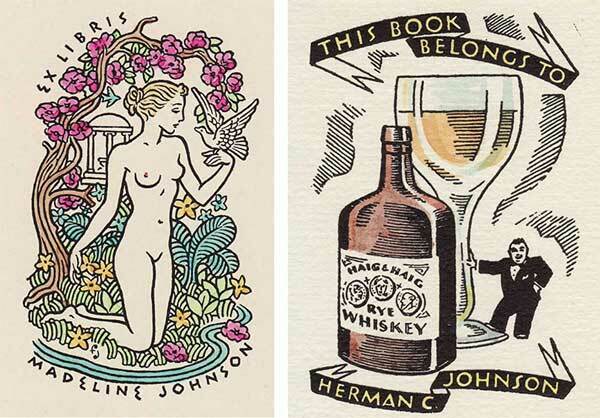 I love the bookplates! Wish I was artistic and could design my own! By the way, there is something very thrilling and mysterious about handling and reading a old book (like 100 years) and wondering about all the people who may have treasured it before. So far the old books I have acquired have not contained bookplates, only names and notes from a gift giver. If only old books could talk!!!!!!!!!!!! “ ” The space dogs were regarded as heroes of the USSR. For the sake of the great goal, it was possible not only to sacrifice oneself, but also other creatures, believed to possess such human qualities as courage.